The “Solar Loop” by Paolo Venturella is a photovoltaic solar sculpture that can be placed in urban and suburban areas in different context. The aim is to expose as much surface as possible to the solar rays during the day. The shape comes out directly from the analysis of the sun path and the direction of the sun rays from sunrise to the sunset. The surface is always perpendicular to the rays, providing a more efficient system. It has been tested that the same standard-oriented and shaped photovoltaic surface produces much less energy therefore the loop is rationally justified as a more efficient solution. The surface is tilted in a different way according to the orientation. The parts of the surface directed to the east and west are more vertical since during the morning and during the evening the sun is low on the horizon, while the south side is designed more horizontal since the sun is higher at mid-day. The “Solar Loop” is a very flexible solution. It can be applied all around the world – according to latitude it changes its tilted angles creating, different shapes and is always optimized in terms of efficiency. The project by Synthesis Design + Architecture is a “cross-strait” cultural center in Fuzhou, designed to commemorate the connection between China and Taiwan. The project is divided into two buildings, with each building conceptually representing a tree of Chinese culture, with three levels of articulation. The first is the Roots, these define the ground plane, landscaping and lower levels of the buildings and illustrate that Chinese culture emerges from the earth of China. The coordinated movement of the two root systems – cultural versus commercial – on the site becomes one network, unifying the site into a fluid and articulated park like condition with many moments of contemplation and pockets of space. The second is Branches, the branches grow from the roots to wrap the cultural fruit-seeds-tree houses that float above the roots and connect the different components to make them one unified whole. This unifying skin uses the graphic effect of a porous network of branches to define and articulate the skin of the building in two ways – as a perforated white reinforced fiber concrete facade system, which is back-lit in the perforations, and as a white translucent lightweight tensile membrane roof system which at night glows from within and by day, glows internally. 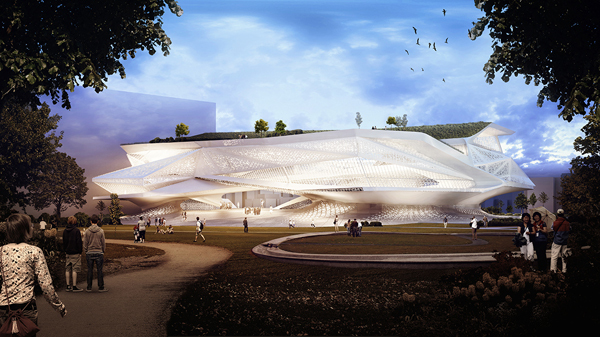 “Cultural Ascent” is Synthesis Design+Architecture’s design proposal for the Taichung City Cultural Center that merges the programs of a public library, fine arts museum, and city park into an iconic contemporary architectural landmark. The aim of the building is to augment its programmatic contents by creating gradient spatial conditions through sectional movement, while utilizing variable façade patterning and articulation to register varying programmatic conditions. The building organization is driven by two ramping and interlocking masses of gradient program – library and museum- that peel up from the landscape in opposing clock-wise moves each hinging on a structural core. Below the ground the two programs are unified through shared parking and administration spaces, while above grade each program operates independently, yet intersects at key moments where exchange is facilitated through shared circulation, vertical cores and a sculptural roof terrace, ultimately merging into a single articulated mass. In section the two opposing ground moves work collectively to frame a connective portal between the urban condition and the park to the south with the mass of the building floating above, while in plan those moves create a multi-story atrium condition. OOIIO Architecture is behind the design of Miraflores – Barranco in Lima, Peru. This iconic proposal for a pedestrian bridge between two districts will bridge over the natural gap called Bajada de Armendáriz, which ends just in front of Pacific Ocean. The bridge brings together two distinct realities – on one side is Miraflores, majestic, residential, were you can find important shopping centers that became new urban attraction points in the past few years. It is also the place where you can find most of the touristic hotels. Barranco, on the other side, is the city bohemian district. On the Colonial Epoch it used to be the leisure area, and it keeps its charm. Nowadays there are many museums and cultural live. Walking though its streets you can find several musicians and at night is the fashionable place to go for dinner with friends. The idea was that two districts both benefit from connection with another. OOIIO proposes a bridge as a landmark, a new city´s symbol, a meeting point, an object that welcomes Lima inhabitants to cross over from one district to the other. Thanks to its special and flashy shape it will encourage tourists walk, promoting urban activities on it. 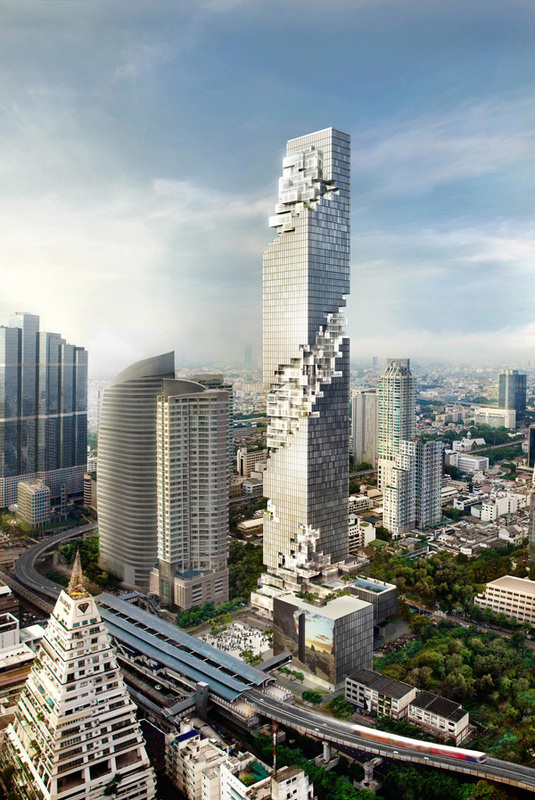 MahaNakhon by Ole Scheeren at OMA is a 77-storey high-rise complex located in Bangkok’s Central Business District. This vertical development of more than 150,000 square meters will be comprised of a landscaped public plaza; a multi-level retail centre with restaurants, cafes, and 24-hour marketplace; 200 serviced apartments operated by the Ritz-Carlton; the Bangkok Edition, a 150 room boutique hotel in collaboration with Marriot International and Ian Schrager; and a rooftop Sky Bar and restaurant. MahaNakhon is the most ambitious complex of contemporary architecture and urbanism in Thailand and the tallest building in Bangkok. The design of MahaNakhon dismantles the typical tower and podium typology, creating a skyscraper that melds with the city by gradually ‘dissolving’ as it flows downward to meet the ground. A series of cascading indoor/outdoor terraces at the base of the tower accommodates retail and entertainment facilities, evoking the shifting protrusions of a mountain landscape. An adjacent freestanding seven-storey building – the “Cube” with corresponding terraces creates an expansive outdoor atrium – forming a valley and network of social, dining, and leisure spaces that serve the residences and the public. MahaNakhon Square, at the front, is designed as a dynamic public plaza, a spot for planned and spontaneous cultural events, a landscaped retreat for the city’s inhabitants, and a rare venue for cultural and social interaction. 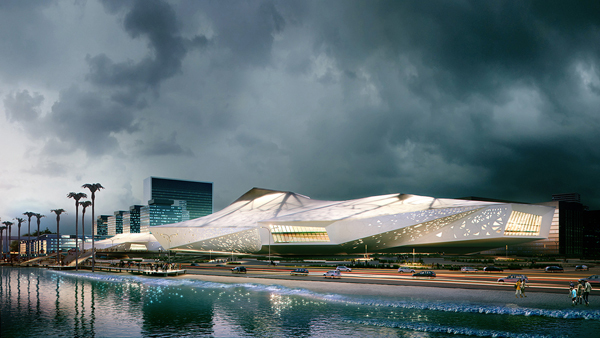 Mecanoo Architecten won second prize in a competition to design a theater and performing arts center in West Kowloon, Hong Kong. Kowloon is an old city district in Hong Kong with a history that dates back to the Southern Sung Dynasty. Located opposite Victoria Harbor, the district has retained an urban quality that is distinct. It is an energetic, dynamic place where improvisation supersedes planning. 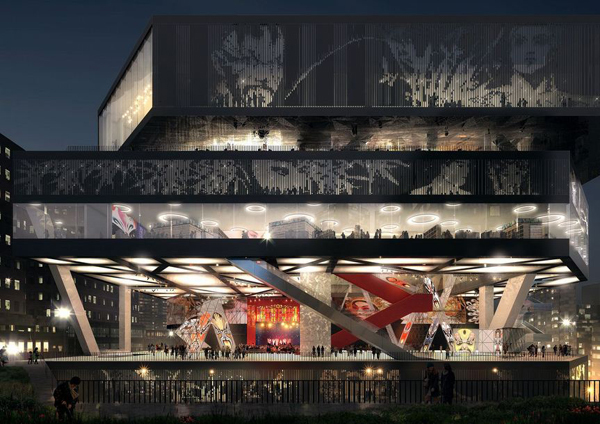 The stacked and partly cantilevered form of the theater complex is integrated into this dynamic urban fabric on different levels by blending city and building in an innovative way. At 20 meters above street level, New Temple Square provides a space for community events that promote the experience of Chinese opera. The double-height transparent foyer on the ground floor also draws connections by revealing the life of the facility. Xiqu Center is organized into two distinct parts with the professional theater program located on the lower levels and on the higher levels the educational program including a lobby, a flexible black box theater, two tea house dinner theaters that overlook the skyline of Hong Kong, catering and commercial shops. New Temple Square is located between the professional and educational functions and is connected to the adjacent buildings via a ramping system. By stacking the professional and educational programs there is both a clear organizational separation and simultaneous stimulation of exchanges and encounters. The façade enhances the appearance of the complex with its vibrant display of alternating lines of glass and steel with engraved images of Chinese Opera. The fly tower of the main hall is surrounded by a media façade that enlivens the elevated square. 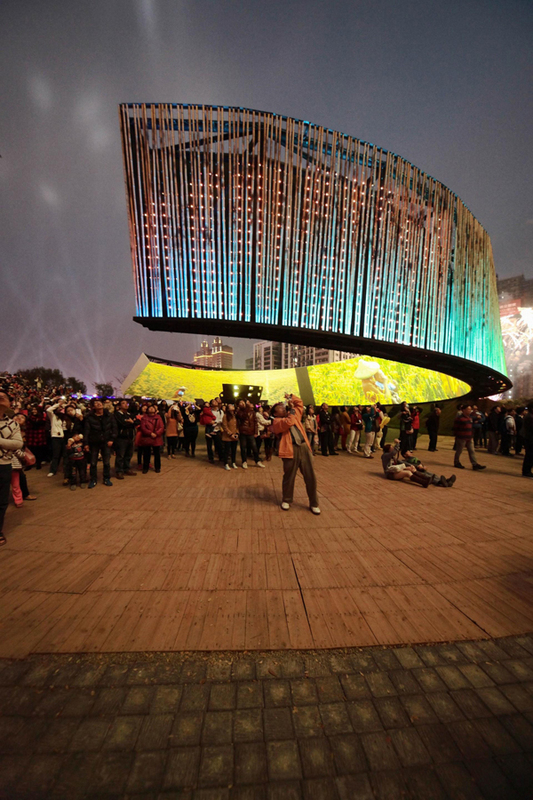 The square is 12 meters in elevation, with columns sized to increase available space in the square – large enough to accommodate a traditional bamboo theater, normally found in squares around West Kowloon. During the time of Chinese traditional Lantern Festival, people offer good wishes and pray for blessing in the coming New Year. To celebrate properly, J.J.Pan and Partners’ proposal for the “Ring of Celestial Bliss” is based on the Chinese saying of “Blessing as high as the sky”. The design is therefore suggesting the immense happiness brought on by the ideal combination of the pragmatic and idealistic sides of technology. Seen from the outside, the lantern appears as a glowing object, hovering in the night, supported by the specially designed steel structure. From inside, one finds himself surrounded by a ring of ever-moving projected images produced by the latest projection technology and LED lighting, which serve as a metaphor for nature’s endless cycle of life and inspires prayers for the future. Furthermore, the shifting inclination of the screen leads to a more dynamic viewing experience and is the culmination of determination and ingenuity when faced with a complex design challenge. The choice of form and materials for the lantern is inspired by the historical and cultural characteristics of Hsinchu, whose ancient name was “City of Bamboo Walls”. While reusable steel is utilized as the primary structural material, the outer cladding is consisted of bamboo trunks. The inner projection screen is made of recycled materials and bamboo sections are used as a permeable flooring material. The locally sourced construction materials have the additional benefit of being environment-friendly with a reduced transportation carbon footprint. 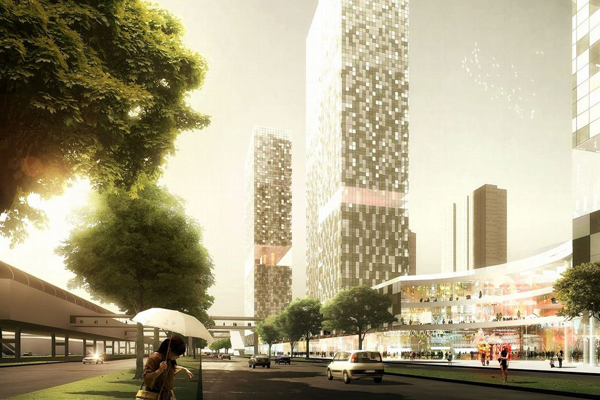 Mecanoo designed a 260,000 m² ecological urban building complex at China’s first special economic zone of Shenzhen. Situated at the foot of the beautiful Tanglang Hills, Tanglang Towers are perfectly placed to capture the busy flows streaming along the number 5 Huan Zhong metro line and major new roads circling downtown Shenzhen. Together, the four towers differing in heights form a noble and elegant composition that will become the landmark of city. Tanglang Towers center is also a world within itself in which the individual programmatic elements – hotel, commercial center, offices, residences and underground parking – work harmoniously and synergistically. A series of stunning atria, a striking sky lobby, a rich green roof garden, and a spectacular central patio will turn Tanglang Towers into more than just a rest-stop along the Huan Zhong metro line or a local center for the surrounding neighborhoods. The entire complex is based on an 8.4m square grid enriched by a series of circular spaces which create the entrances, atria and patios. The Metal Patio forms the vibrant heart of the Tanglang Towers complex. The patio is gently inclined to create a natural amphitheater, much the same as with the Piazza del Campo in Siena, Italy. 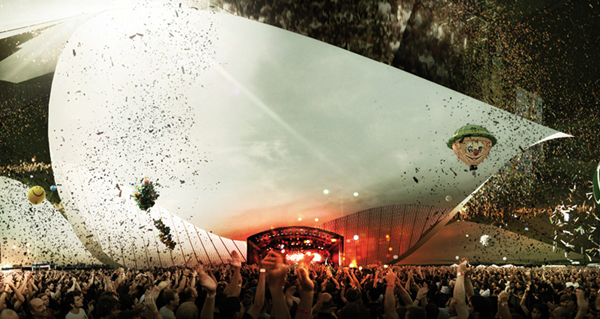 This provides the setting for a myriad of activities; from dance performances to public celebrations. The shopping mall consists of anchor stores, retail stores, cafes, restaurants, a cinema and a supermarket. 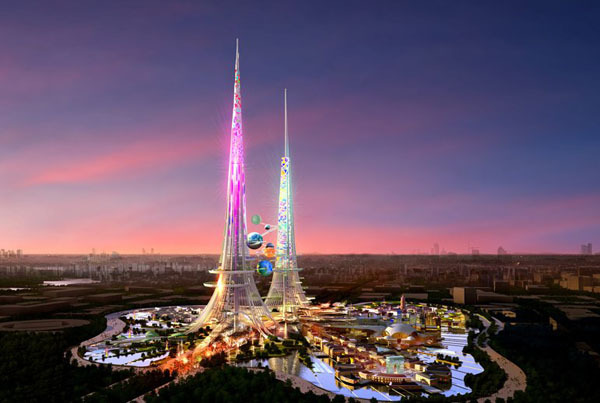 World’s tallest skyscrapers could be built in Wuhan, China. British architectural practice Chetwoods proposed Phoenix Towers – iconic landmark within an ambitious environmental master plan for the capital of central China. At one kilometer high the Phoenix Towers will be the tallest pair of buildings in the world. Arching bridge-like over the surrounding boulevards, each tower will have a unique personality and attributes: the Feng tower will lean towards the commercial zone, the Huang tower towards the cultural and recreational zone. The project’s key emphasis is on the harmonious combination of 21st century Western technological know-how and experience with Chinese tradition and culture. In response to the Client’s wish to develop a new style of architecture that emphasizes Chinese identity, the use of a pair of towers reflects the dualist elements of Chinese culture in contrast to a more Western monolithic form. 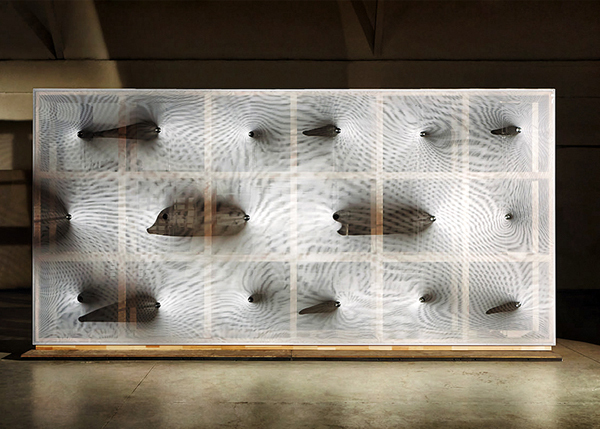 Barkow Leibinger’s “Kinetic Wall” is a prototype created for the 14th International Architecture Biennale „Fundamentals“ in Venice. The installation revisits the utopian dream of an architecture that can move, kinetically, first realized in the 20th century through modernism. This addition culminates an historical evolution of wall making – stone, brick, wood, glass partition, in the context of the Wall Room at the „Elements of Architecture“exhibition. Surface – the wall – movement is activated by a series of motorized points which extend and retract that transform an elastic translucent synthetic fabric into a topographical section of peaks and valleys. This movement transforms the exhibition visitor’s corridor between the “Kinetic Wall” and the adjacent glass partition wall into a differentiated arch-like space. The limited and changing width of the passage ensures an immediate, intimate, and corporal relationship with the viewer-visitor. A digitally controlled choreography enables endless surface patterns, which emerge slowly then recede and change. This visual- surface effect is further enhanced by the two layers of grid fabric which when shifted over each other produce a moiré effect, a second scale of movement that is translucent and ephemeral.